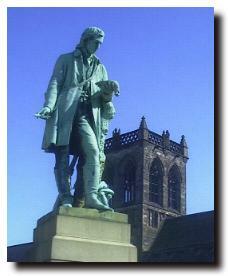 Wilson was born and educated in Paisley (where there is now a monument to him beside Paisley Abbey - see illustration above). He was apprenticed as a weaver and worked in Lochwinnoch (which may have given him his early interest in ornithology as nearby is Castle Semple Loch which is now a bird sanctuary). He began writing and selling popular poetry. But in 1793 one of his verses resulted in him being jailed for libel. Following his release from jail, he emigrated to America in 1794 and was employed as both an engraver and a school teacher. But it was his study and drawings of American birds, begun in 1803, for which he is now remembered. He explored much of the eastern half of the USA, observing and drawing - and managing to sell his output. He travelled only with "Poll", a Carolina parrot, over thousands of miles. He published seven volumes of his "American Ornithology" during his lifetime and a further two volumes were printed after his death (from drowning in a river while pursuing a bird). He is buried in Philadelphia.